Rustic, hipster-grunge Greenpoint meets classic Japanese culture in Amami, a modern sushi-ramen eatery decked out in a mix of retro light fixtures and elegant geisha portraits in North Brooklyn. Tickling the border between Williamsburg and Greenpoint, Amami is the matcha-encrusted offspring of Chef Nick Wang. 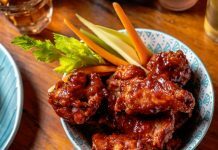 You may recognize the China-born restaurateur from renowned midtown sushi bistro Hatsuhana, where Wang worked as executive head sushi chef, or from Ako, another sushi destination Wang also owns on Bedford Avenue in Williamsburg. Wang’s nautical upbringing in a fishing village inspires most of Amami’s menu, along with the original modern twist he brings to his creations. Amami’s bar area has spacious seating — ideal for sipping an aperitif and munching on one of what the house calls “Bites” while you wait for your table. In addition to the extensive beer, wine, and sake menus, Amami boasts an ambitious cocktail program. Selections range from a Japanese Old Fashioned among the signature items to a Manhattan from the “Prohibition-Era Classic Cocktails” list. Amami has a fully stocked bar, so make sure you come thirsty. For starters, the purple potato fries are tantalizing, and quite frankly mandatory. Prepared tempura-style and lightly salted, the crunchy batter is complemented by the subtly sweet side of matcha mayo. Another must-have is the short rib negimaki. Each order comes with six sushi-like rolls of succulent, thinly sliced grilled beef, wrapped around small bunches of grilled scallions. 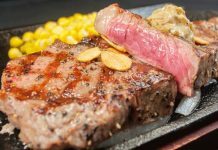 They soak in a small pool of teriyaki sauce, which is specially prepared with less added sugar to bring out the taste of char-grilled juices from the meat. Amami’s appetizers come in relatively hearty portions, so be prepared to share with the table. The tuna-salmon twister is a crowd favorite — it’s a sweet yet spicy signature dish at Amami. Between spice-crusted tuna, avocado, and rice, a healthy serving of crunchy salmon curves along a bed of honey-roasted peanuts. 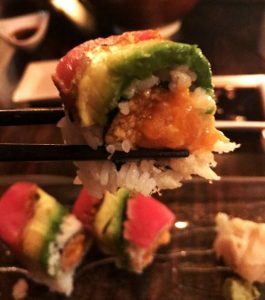 These rolls are enormous and immediately melt in your mouth when dipped in Amami’s homemade wasabi and soy sauce blend. Whether it’s a hot summer day or balmy autumn evening, you can never go wrong with an order of ramen. 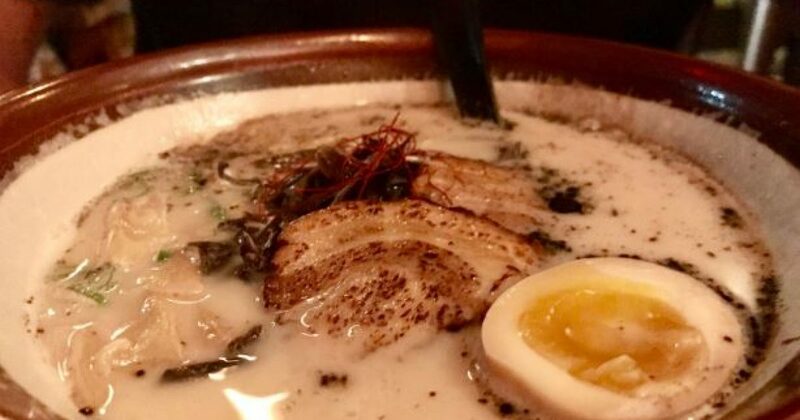 The tonkotsu ramen is presented in a pork bone broth base, with a rich dash of coconut milk. Generous slices of thinly cut pepper-crusted pork delicately pulled apart over a bed of al dente ramen noodles, a soft-boiled egg and a generous handful of seaweed. Make sure to ask for a side of the homemade chili oil on the side, if you like it hot; it has a pleasant garlicky kick. Amami’s dessert menu goes far beyond the tiresome fried ice cream. Most notable is the fluffy and unobtrusive house-made green tea tiramisu. Layers of green tea, rum, and saturated sponge cake graze a splash of chia seed sauce, making way for a radiant, yet not overly excessive, end to the meal. 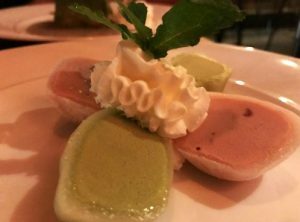 The mochi is also a lighter dessert option that comes with two halved mochi balls, separated by a dollop of whipped cream. Choose from among red bean, green tea, or vanilla, or mix and match. The mochi’s outer glutinous rice layer is soft and chewy, and is delicate enough to easily slice with a spoon. If you seek a heartier dessert, Chef Wang makes homemade ice cream. Wang rotates between flavors, but make sure to ask if he has any miso ice cream on hand — its uniquely salty flavor harmonizes with elusive hints of fragrant vanilla. After a few minutes, you will find that the three desserts are gone as quickly as they came, and looming thoughts of licking the plate are threatening and provocative. Reservations can be made online, and while weekends tend to attract a crowd, Amami is still relatively full on weekdays. Amami also serves weekend brunch, which will sadly have to wait until next Saturday morning. Street parking is scarce, though the restaurant is conveniently located near the Nassau Avenue G-Train stop. 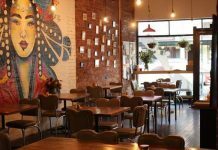 Price range: $5 to $11 for starters, $13 to $27 for main courses, $4 to $7 for dessert. Amami, 57 Nassau Avenue, Brooklyn, (917) 909-1568. Open seven days for dinner, Monday through Friday for lunch, weekends for brunch. Major credit cards are accepted.